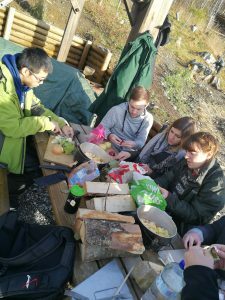 A sunny day in Bergen in November 2017, Marianne and Andrea brought their class of international students from “Sustainable Development by Involvement” (3 year students), and hiked up to the Food Forest at Ulriken. 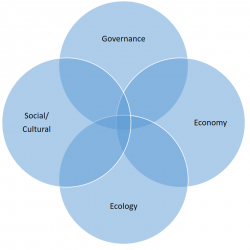 Here we attended a guided tour by the talented ecologist Benedicte Brun. We were also joined by the artist Margrethe Kolstad Brekke, who makes podcasts about sustainability and sustainable development. 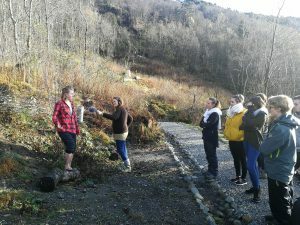 This day we focues on resources, and Benedicte gave us a guided tour focusing on the Food Forest as a resource, with weight on cycles in nature (such as phosphorus, kcrbon and other nutrients). 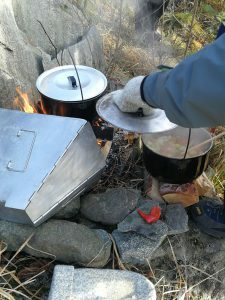 Then we made vegetable soup and apple pie. Students and teachers were very happy with the day!